Published in the Dover Express, 16 January, 1981. During the interval since the opening of the park time has matured the growth of its forest trees and shrubs, giving the place a sylvan charm, which in its earlier period it lacked. The park is a possession to be proud of and to enjoy. The natural slope of the lower part was excavated, levelled, and embanked, forming four lawns, each clothed with verdant, springy turf, and surrounded with walks and sheltered with shrubberies. These lawns extend along the lower side of the park from the Lodge entrance to the middle gate, and at the back of the third lawn there is a lake; while at the northern end of the water, near the Duchess of Connaught’s tree, was erected a handsome drinking fountain, the gift of Dr Astley, the water running through it serving to keep the lake fresh. 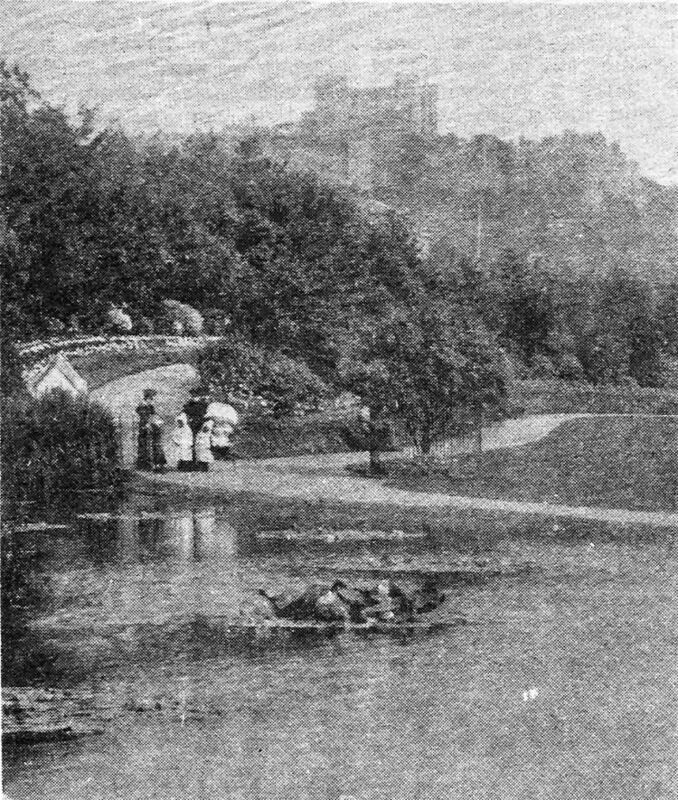 The slope above the lake was partly laid down with grass in its natural formation, but towards the north-western end large tennis lawns, and playgrounds for children were created. In the centre of the slope, as the park was originally laid out, there was a flagstaff plateau, complete with flagstaff 97ft high, given by Mr William Crundall in 1884. In other portions of the upper slope grow clumps of forest trees. Along the whole length of the top, extending from the castle nearly half-a-mile westward, was formed a grand promenade, sheltered on the northern side by a hill and a thick belt of black firs, which provided a panoramic view of the Channel, while across the Dour Valley are to be seen to advantage the seven western hills of Dover—the Western Heights, Stepping Down, Priory Hill, Char>el Mount, Whinless Down, Bunker's Hill and River Minnis, with their deeply scored vales between. About midway along this upper path a pleasant shelter was erected, another gift of Dr Astley. From the lower lawns, three paths led to the upper walk, one at the north-western end up a shady slope, where beneath the sheltered trees Rose of Sharon was planted. A zigzag path led up from the further lawn, having a charming western view; and the third path from the central gate skirted the southern side through a luxuriant avenue of foliage, reaching the top opposite the Waterworks. At the end next Castle Hill, another lawn was laid, above which was formed a terrace with seats, affording unique views of the castle and harbour. At no time since its inception has the park lost its appeal, although the natural growth of some of the plantings of trees which shelter the lawns has inevitably impaired some of the views which used to be obtained from it. When the jubilee of the opening of the park was celebrated in 1933 its value to Dover was widely acclaimed and the debt owed to Mr Chignell was fully recognised. During the celebrations a copper beech tree was planted by the Mayoress Mrs P. H. Morecroft. and the other for Non-conformists. Next to St Mary’s is a square piece of ground, dedicated as the Jewish cemetery. On the opposite side of the way is Charlton cemetery, first used in 1872. This, like St Mary's, was provided with two chapels, for churchmen and non-conformists, but united in one building. The entrance to this cemetery is at the junction of Frith Road and Cow Pastures Lane, where there is a large iron gate of excellent workmanship made by Mr R. W. Pierce. The oldest cemetery in this road is St James's, known as Copt Hill. It consists of six acres in a blind ravine, from which the ground rises abruptly up to Fort Burgoyne. This was opened in the year 1855, St James’s old churchyard having been closed then by the order of the Board of Health. Further up Frith Road, on the north side, is the Danes recreation ground, originally consisting of nine acres, but since greatly enlarged, purchased from the Dover and Deal Railway Joint Committee, the ground consisting of a large plateau formed with the surplus chalk excavated from the Guston tunnel. This ground was acquired by the town council in 1891, and opened on the 3rd of October in that year, the Mayor, Mr Alderman W. J. Adcock, kicking off in two games of football, one Rugby and the other Association. This ground is owned and maintained by the corporation, and is used for games, and also for fetes. The ground is called the Danes, after an ancient name attached to the land, which was called Charlton Danes, probably derived from Dens, a word of Saxon origin, which, in Kent, is a term applied to clearings in woods or thickets. During the 1914-18 war the Danes was used as quarters for Field Artillery, their huts and stables covering it. On the other side of the Deal railway line was Long Hill Camp consisting of a big assembly of military hutments built over the field once known as Cow Pastures. After the war the land was bought by the Education Committee for use as playing fields for the Boys’ County School, now the grammar school. The old hamlet of Charlton, clustered round a green and what is now known as Maison Dieu Road, has undergone considerable change over the past hundred years. When this book was written it included Frith Road, Palmerston Terrace, Alma Place, Charlton Villas, Dour View Cottages, Castle Cottages, Cook’s Cottages, Wood Street, Peter Street, Dour Street, Brook Street, Colbran Street and Catherine Place, many of which have now disappeared. High Street, in the parish of Charlton, extends from the Town Hall to what used to be known as the Black Horse valley, the vale between Priory Hill and De Burgh Hill, now called Tower Hamlets. The road was widened in stages between 1899 and 1903 at the Maison Dieu end, the upper part being considered to be of sufficient width. It was not foreseen that a bottleneck would be created as traffic grew and shop fronts were carried forward over what used to be gardens in front of houses which lined the road towards the Bridge Street end. 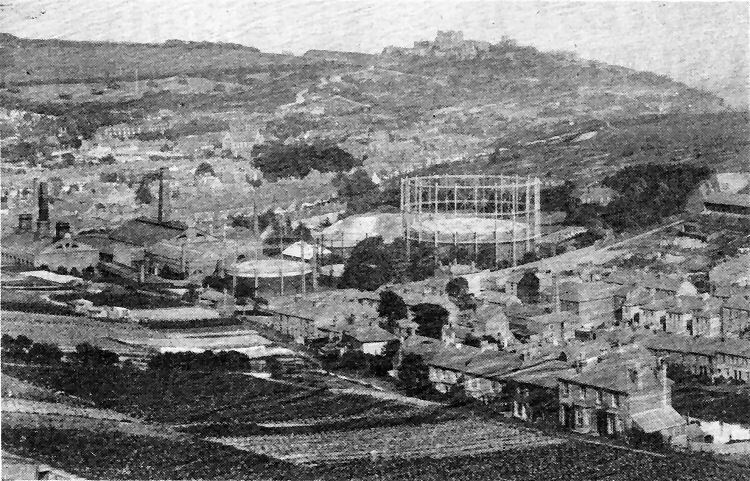 An 80-year-old view of Dover from Coombe Valley showing the extent of Connaught Park, running from the left of the picture near the sky-line towards the top of Castle Hill, with Mr William Crandall’s flagstaff, reputedly 97ft high when first erected, in the centre of the lower section. In the foreground is St Radigund’s Road and, in the centre the old gas works. In the original picture the older gas works at Trevanion Street, near the sea front, are also visible and, in the harbour, work is proceeding on the construction of the Eastern Arm. The picture, above, is an early 20th century view of Connaught Park.